On the ninth anniversary of the entry into force of Pope Benedict’s motu proprio Summorum Pontificum, we are glad to announce the participation of William Cardinal Levada, Prefect Emeritus of the Congregation for the Doctrine of the Faith, in the fifth international Summorum Pontificum Pilgirmage in Rome. His Eminence has accepted to give the homily for our usual Solemn Mass in St. Peter’s Basilica that will be celebrated at Noon on Saturday, October 29th. It will be a great joy and blessing to have Cardinal Levada, a former Archbishop of Portland, OR (1986-1995), united in prayer with the present Archbishop, the Most Reverend Alexander K. Sample, who will be the celebrant of this Mass and will guide the pilgrims during the entire pilgrimage. It was Cardinal Levada, as President of the Pontifical Commission Ecclesia Dei, who signed the Universae Ecclesiae instruction that confirmed the implementation of Pope Benedict's motu proprio. 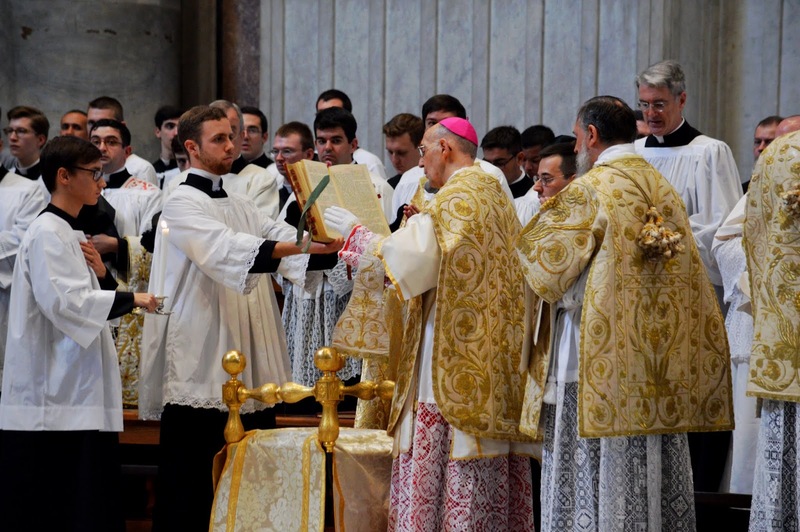 From last year’s pilgrimage, the Pontifical Mass celebrated in St Peter’s by Mons. Rodolfo Laise, Bishop Emeritus of San Luis, Argentina. *** Nota bene: Recognizing the unstable condition of the Basilica of St. Benedict due to the earthquake that struck Norcia on August 24th, the opening day of the pilgrimage remains as originally scheduled to be held in Norcia, the hometown of St. Benedict, beginning on October 28th. This Saturday, September 17th, our General Secretary will visit Norcia to inspect and decide with the monks in conjunction with the local authorities of any eventual adaptation to the program and will duly communicate afterwards with all the pilgrims.